A breakout strategy is a valid strategy that you can use in stock trading. You can use this trading strategy also to trade Forex, commodities like gold, silver or oil and also other instruments. There are several different breakout strategies that use many different styles of breakout. Here I describe a breakout strategy that is based on the simple concept of support and resistance. This trading strategy for stock breakout is based on a technical analysis. The two basic elements of this stock trading strategy is a support or resistance. This strategy trade stocks, commodities or currencies that break from a trading range that is well defined by support and resistance. You can use this strategy also to trade stock breakout intra-day in your daytrading system. 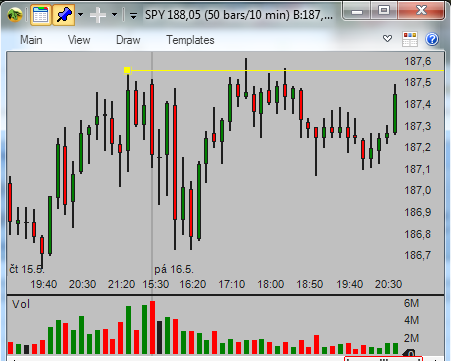 Here is a typical definition of a resistance on SPY intraday chart. 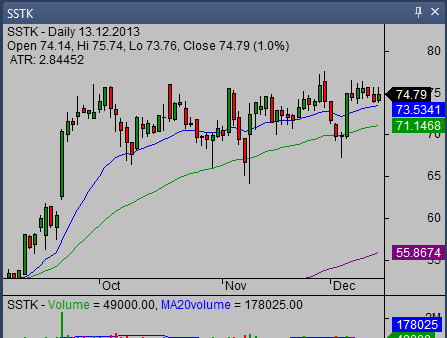 This type of breakout stock trading strategy is a trend based strategy. You expect that the breakout of a resistance initiates new strong move up. If you use this strategy for swing trading or position trading, then such strong move could last several days or weeks. But the main condition is that major market trend is bullish. A general trend helps breakout traders to gain more. If you want to trade breakout intraday then you have to be sure, that trading mood for actual day is bullish. It is not necessary to have strong long term or mid term bullish trend on daily or weekly time frame. The only condition is to have bullish momentum intraday. You have to be sure, that market is in positive intraday trend (for intraday systems) or short-term and midterm (for swing and position trading system). If you will try to trade bullish breakout strategies in another state of the market, then your trades will not work. Breakouts will fail and you will be stopped out many times. If you want to trade this bullish strategy you have to plan your trade in advance. You have to define several important values to make bullish breakout stock trade successful. Here is the list of the most important steps. There is also possible to trade bearish version of this strategy. It is more known as breakdown stock trading strategy and it uses support as a base for price breakdown. Breakout trading strategies are really safe and profitable strategies for stocks, commodities and currencies when the general market is bullish and provides support. These strategies generate huge profits in a bullish market environment and so you have to use them in your trading systems.